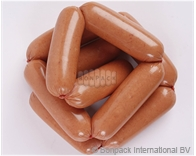 LST is a multilayer barrier casing designed for production of all types of frankfurters, wieners, hot dogs, mini-sausages, spreads, liver sausages, and spreadable sausages. The distinctive feature of the LST casing is absence of migration of the colorant from the product into the environment during the thermal processing or heating for consumption by the end consumer. LST: Ease of peeling when peeled manually immediately after the thermal processing or by the end consumer, without the stage of spraying (cooling). LST PL: Ease of peeling when peeled automatically. A - Closed end of the shirred stick, the casing is designed for use on automatic equipment. R - Open end of the shirred stick, the casing is designed for manual tying and use on stuffers with twisting devices. Colors: Clear. Bespoke colors are available. Forms of supply: in shirred sticks.